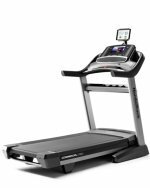 The Office Treadmill Desk – Combine Work and Exercise! For those who can’t be productive enough, an office treadmill is the perfect way to multi-task by combining work time with exercise time. Walking on a tread belt improves your calorie burn ratio to slim your body, builds stronger bones, and actually helps keep you mentally focused on your work. You can burn calories easily while doing conference calls, checking email and orders, or doing any of your daily desk tasks. 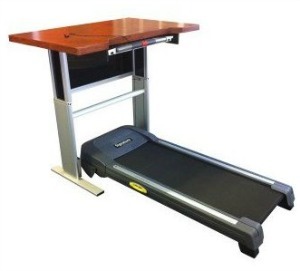 There are two types of office treadmills on the market: those that are simply desks with enough clearance and width to allow a treadmill (which you supply) to slip underneath, and an actually treadmill desk, which is all one unit: a treadmill with a desktop mounted right on the frame. For example, the TrekDesk Office Treadmill Desk attaches to almost any treadmill with a workspace that measures 74 by 34 inches, and adjusts to users in height from 5’4” to 6’4”. It offers some cool features a normal desk does not have such as two built-in cup holders, a manuscript stand, and four-level file folder. The desk attachment weighs just 58 pounds and folds away for easy storage. 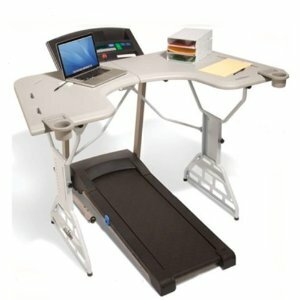 The second type, a Treadmill Desk is more expensive since the machine is attached. Though it offers a 12” height adjustment, the drawback is that it is more difficult to get a proper height for the best access to the keyboard on the desktop. Also, you may find that the ergonomic fit may not as comfortable as you would have with the more versatile TrekDesk. The most important point to adding a desk to a treadmill is that you have a strong motor to handle continuous slow walking. You don’t want a motor that will run hot and burn out fairly quickly since you will be walking at a pace of about 1 to 3 mph. Make sure the motor is rated to be at least a 1.5 continuous duty with low RPMs. Generally, a good motor will be backed by a warranty of 10 years or longer. For example, NordicTrack makes a good model with a solid warranty. You can see their latest model on sale here. Users who go this rather unconventional route of exercising and working at the same time have found that having a treadmill desk is well worth the price and something they wish they had tried years ago. While you might think it difficult to get used to typing on a keyboard while walking, most people find that they adapt quite nicely in just a matter of minutes. If you don’t have time to spare for exercising each day, the office treadmill desk is a good choice to help you stay fit while getting more done.